When Teenage Mutant Ninja Turtles premiered on television, it began a phenomenon that has helped keep it in the American consciousness for almost three decades. Several series would follow shortly after that carried similar themes, be it purposefully or by coincidence, that nonetheless are forever observed as clones. 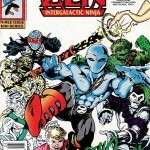 Created by Steve Stern and Dan Cote in 1987, Zen the Intergalactic Ninja was self-published under Zen Comics before being licensed to Archie Comics in 1992 for two three-issue mini-series. 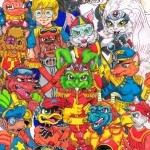 Archie would license Teenage Mutant Ninja Turtles of Mirage Studios from 1988 to 1995. The two franchises had similar origins, both fusing science fiction and martial arts (specifically ninjutsu) while published independently, leaving the rights to each property to its creators. As both ended up licensed at Archie, they also shared the legacy of accompanying toylines and video games. What is likely the most glaring difference is that a Zen cartoon was never produced (that and, of course, Zen never took off like TMNT). Zen started out as a genetic experiment on the planet Baltoon deemed to be destroyed but was instead raised by the Masters of Om in the ways of the martial arts. Zen would use these talents as a highly-paid mercenary. Zen’s image was revamped in a similar manner as TMNT, where both were violent but sanitized to be used with a young audience. For Zen’s adaptation for Archie, the toyline, and video game, it borrowed a theme from another popular franchise. Captain Planet and the Planeteers premiered in 1992 reportedly as part of a quest by Ted Turner to raise awareness of the environment and the affect pollution is having on it. Catching on with viewers, Zen received a nemesis in Lord Contaminous and his followers Sulfura, Oil Slick, Garbageman, Smogger, and Zen’s clone Orange Julius. To combat them, Zen, joined by Jeremy Baker the Starchilde, created the Recycled Heroes using the Recyclotron: Lawn Ranger, Pulp, Bottle Bandit, Can-It, and Lights-Out. 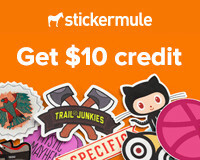 Though, the concept seems more like the Toxic Crusaders to me. Larry Hama (G.I. 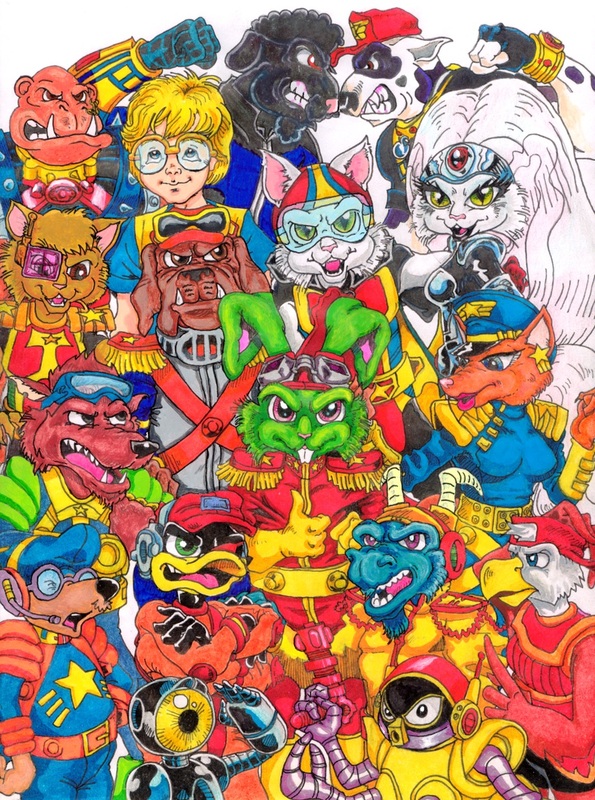 Joe) created Bucky O’Hare in 1978 and published him in Continuity Comics in 1984, premiering the same year as Teenage Mutant Ninja Turtles and nine years before Nintendo’s Star Fox. Leading the crew of the “Righteous Indignation,” Bucky battles the malicious Toad Empire out to conquer the United Animals Federation and the known Aniverse. However, the success of TMNT brought attention to Bucky as well, spawning an animated series, toyline, and video game in 1991. While Bucky shared a similar franchise treatment and origin in terms of coming into being to TMNT, they share little else but both being science fiction adventure series. 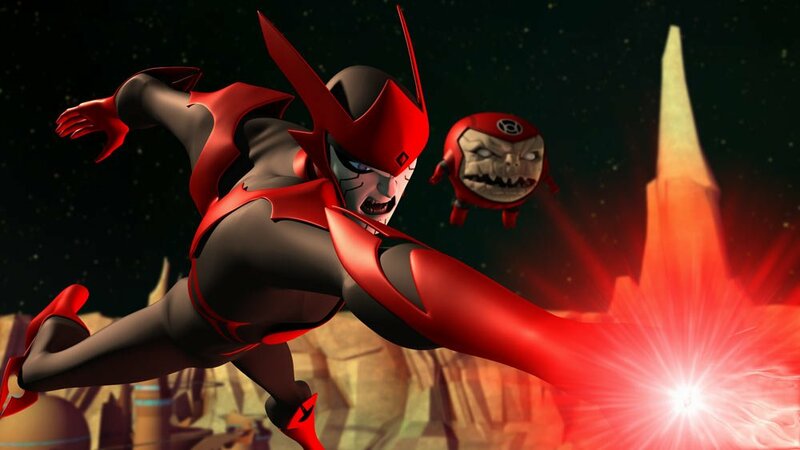 The Ninja Turtles had martial arts and largely operated in New York where Bucky O’Hare operated a starship in space and emulated the likes of Flash Gordon and Buck Rogers. If anything, I would draw a line to Marvel Comics’ Rocket Raccoon created by Bill Mantlo. Created by Tim and Chris Stamper for Rare, Battletoads was developed to rival the popular series of Teenage Mutant Ninja Turtles games. Telling the story of Rash, Zitz, and Pimple, Battletoads tasked with protecting Princess Angelica, daughter of the Terran Emperor, their mission becomes one of rescue when the Dark Queen kidnaps her and holds her captive on Ragnarok’s World. 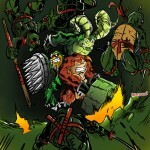 While the Ninja Turtles employed weapons and martial arts, the Battletoads were brawlers using cartoon-inspired exaggerated attacks. 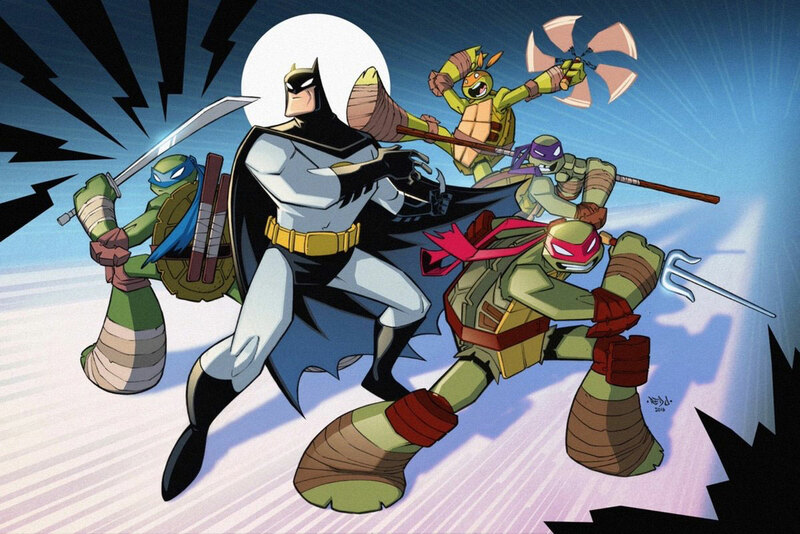 DIC Entertainment would also produce an animated adaptation, trying to likewise capitalize on the success of the Ninja Turtles animated series (something they would continue to try for later with Street Sharks and Extreme Dinosaurs). 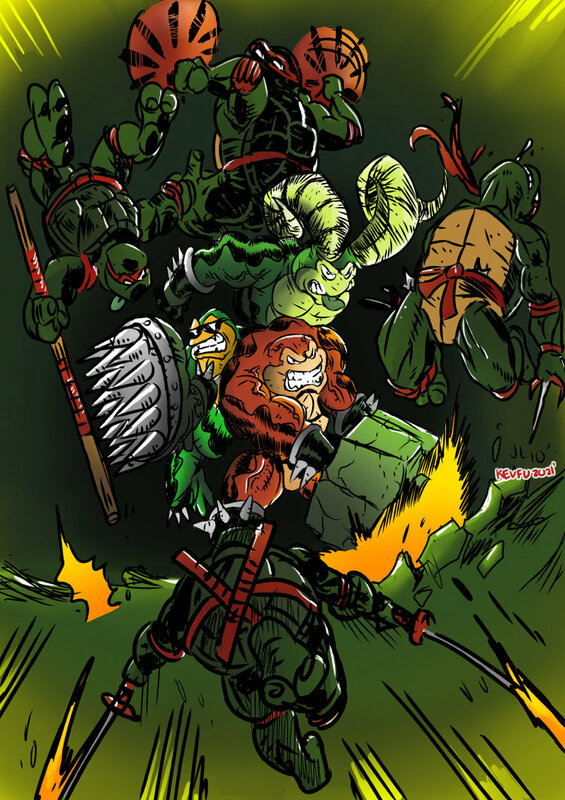 And while TMNT would crossover with fellow indie comic heroes like Miyamoto Usagi, Panda Khan, Cerebus the Aardvark, and Flaming Carrot, the Battletoads were part of a crossover video game with Double Dragon. Ryan Brown, comic book artist at Mirage Studios that designed several of the character designs for the Teenage Mutant Ninja Turtles toyline and spearheaded a revamp of Teenage Mutant Ninja Turtles Adventures with Stephen Murphy (the two would co-create the Mighty Mutanimals), created the Wild West C.O.W.-Boys of Moo Mesa television series for ABC in 1992. Set in the late 19th century of the western United States, a meteor strikes the Earth raising a mesa above the clouds and those therein turned into humanoid cows and adapting a way of life more in keeping with the mid-19th century. As crime became too much for the emerging Cowtown’s Mayor Bulloney and Sheriff Terrorbull, it fell upon the C.O.W. Boys (Code of the West), Marshal Moo Montana, Dakota Dude, and Cowlorado Kid, to return order (in reality, the mayor and sheriff being behind the rise in crime). 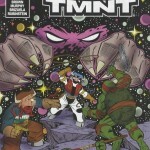 In keeping with emulating the Ninja Turtles franchise, the series was supported by toys, comic book, and video game. 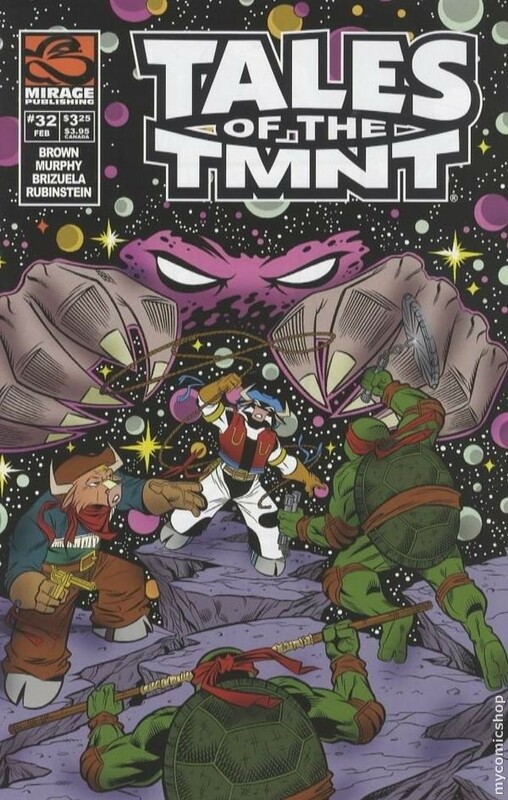 The comic book, interestingly enough, was licensed to Archie Comics but it wouldn’t be until 2006 when the Ninja Turtles finally teamed with the C.O.W. Boys in Tales of the Teenage Mutant Ninja Turtles. 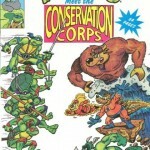 Archie Comics, having the license to publish the Teenage Mutant Ninja Turtles and other licenses such as Zen and the C.O.W. Boys, would created their own comic book featuring anthropomorphic characters thanks to Dan Nakrosis and Paul Castiglia in 1993. 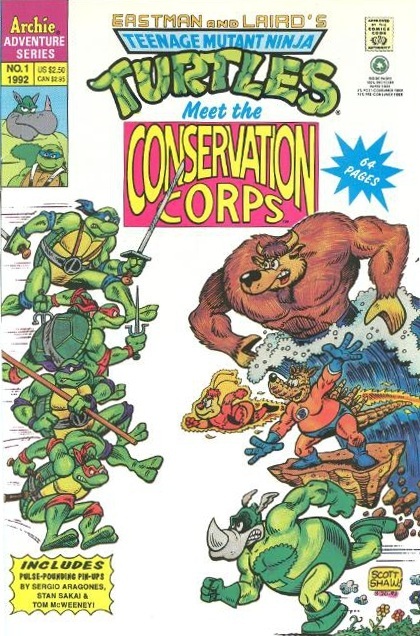 The Conservation Corps was a three-issue mini-series printed on recycled paper with soy ink starring a quartet of elemental-empowered animals mutated by aliens for the purpose of saving the environment (throwing back to their previous adaptation of Zen which emulated Captain Planet). 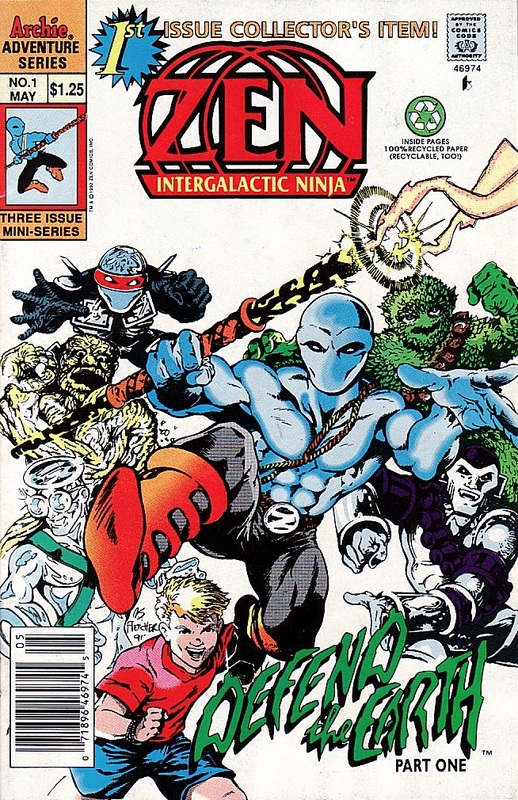 Stone Hedgehog, Firefly, Water Buffalo, and Greenhorn (and later, Skyshark) teamed with the Ninja Turtles in their first issue as they educated people about green living while battling the likes of aliens, robots, and cyborgs out to mine or pollute the planet. When Mars is turned into a warzone by the evil Plutarkians for its resources, three of the planet’s resident mouse-like humanoids escape only to be stranded on the planet Earth. There, they discover Lawrence Limburger, advance scout of the Plutarkians, as he steals the planet’s resources for his race. Unwilling to see their adopted planet turn into their former home, the Biker Mice from Mars take up arms to beat back Limburger. 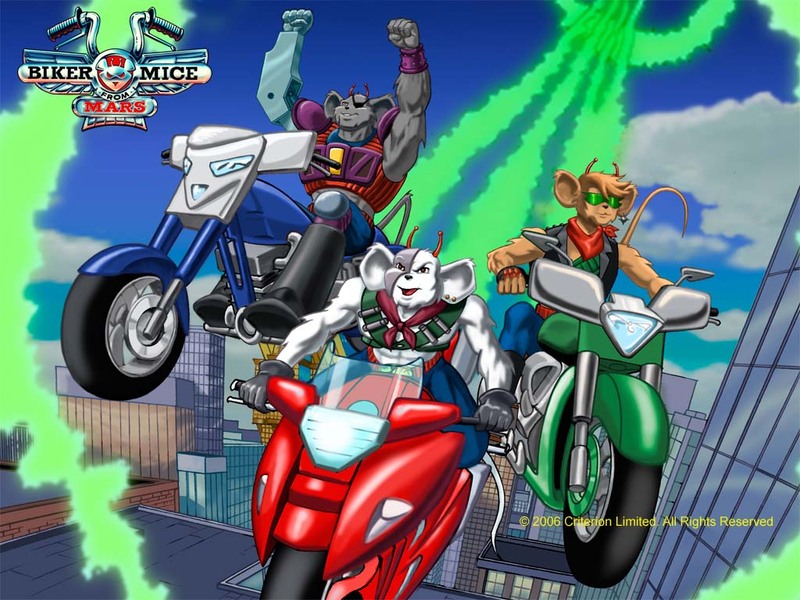 Created by Rick Ungar in 1993, Biker Mice from Mars lasted three seasons on air (not including its brief revival in 2006, perhaps prompted by the success of the Teenage Mutant Ninja Turtles revival in 2003), a toyline, video game, and comic book series by Marvel Comics. 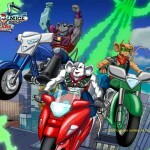 Biker Mice may arguably be the most successful “clone” of the TMNT franchise. While it’s up to debate what inspired the creation of Dinosaucers, with arguments made for franchises like Transformers, Teenage Mutant Ninja Turtles, and Thundercats, I think people tended to draw the line upon discovering the rare Glasslite and unproduced Galoob action figures which appeared as some cross between TMNT and Masters of the Universe in design. Regardless, Michael Uslan (key producer for the Batman film franchise and animated series) created Dinosaucers for DIC Entertainment in 1987. The series tells the story of the civil war between the anthropomorphic dinosaur Dinosaucers and Tyrannos of Reptilon as the latter come to Earth to conquer the world and use it as a staging ground for building weapons and vehicles to conquer their home planet. The Dinosaucers, then, come to stop their cousins with the help of teenage Earth people the Secret Scouts. 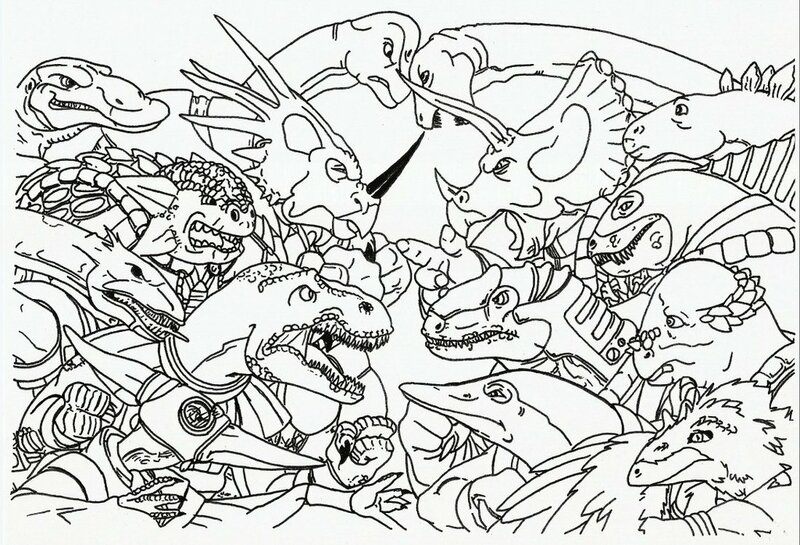 In the TMNT mythos, of course, there’s the Triceratons, and the Dinosaucers have a blue triceratops member named Tricero and the Tyrannos have the orange styracosaurus Styraco. PreviousYoung Justice: Who is the Traitor? 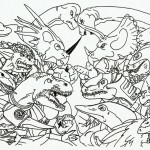 We can also add Street Sharks and Extreme Dinosaurs to this lits.